Sadly, work is getting in the way, and I won't be able to post as extensive a guide as I hoped before polls close. The basic thing to remember is that states are typically called immediately only when the margin is greater than 10%. Looking at my state-by-state map, this means that while most states in dark blue/red will be called right away, most (if not all) other states won't. Obama supporters certainly shouldn't freak out if PA isn't called right at 8pm ET, or MI/MN aren't called right at 9pm ET. We likely won't get a call in any battleground state (tossups and those coloured in the lightest blue or red) until at least 10pm ET. So if you're on the East Coast, you can probably go have a nice long dinner and still not miss any big calls. If any of PA, MN or MI is called before 10pm ET, Obama is performing at least a little better than expected, and he should probably be viewed as a 95%+ favourite. (Right now, it's more like 90%.) On the other hand, if NC is called for Romney before 10pm ET, then Romney is overperforming, and we're likely in for a long long night. Also, keep an eye out for Marriage Equality propositions in ME, MD and WA, as well as MN's proposal to enshrine discrimination in their state constitution. For posts on the Presidential election, click here (state by state) and here (popular vote). Note: Maine is safe for independent Angus King; it is coloured in light blue since he is likely to caucus with the Democrats. Some states are less solid than the others. Of the "lean Democrat" states, I'm least confident about MA, IN and VA. Of the "lean Republican" states, ND and NV have the best chance of causing a surprise. I think the Democrat is marginally ahead in both tossups, MT and WI. However, the advantage is so slight that they might have a better chance of splitting. (For example, if the Democrat has a 60% of winning in each, and the two races are independent, then the Democrats have a 36% of winning both, and the states have a 48% chance of splitting.) For this reason, I view the most likely outcome as the Democrats winning all states coloured in blue and both tossups, but the most likely seat count as 53-47. Click here for a summary of national polls. A small number of pollsters are expected to release their last polls on Election Day. This post may therefore be updated. Detailed posts coming up overnight or in the morning. But since the polls will be closing in about 20 minutes in Dixville Notch and Hart's Location, NH (these hamlets vote at midnight and are allowed to close their polls when everyone has voted), I'd like to give some approximate projections now. Obama wins the popular vote by about 1%. 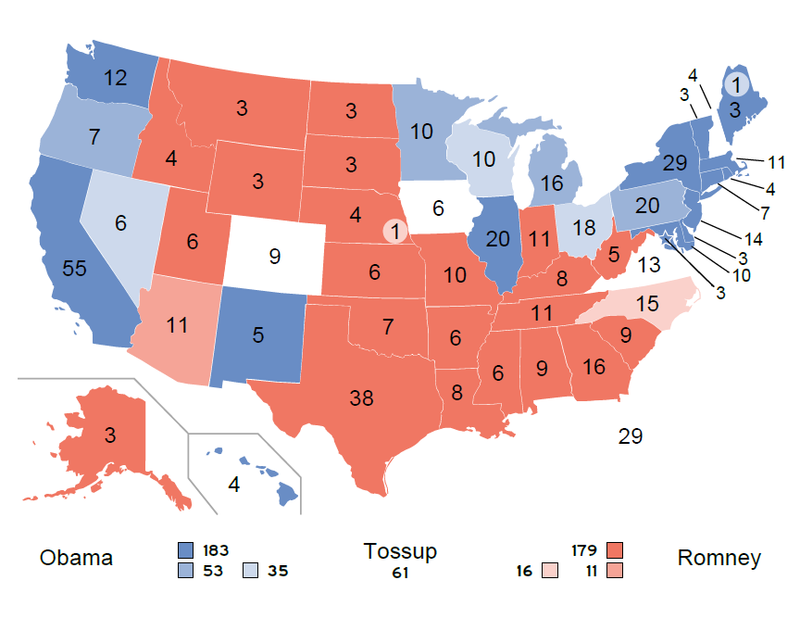 Obama wins between 271 and 347 electoral votes, likely 303. The state of the race has moved very little from three weeks ago - so little that a few times, I thought about writing an update, but gave up since there was basically nothing to add. This national movement was reproduced in many of the swing states. In particular, Virginia, Colorado and New Hampshire, which were virtually perfectly tied as of my last post, now all appear to have an ever so slight Obama lean. Obama may not win all three, but Romney is even less likely to sweep them. Similarly, in Florida, Romney's already slight advantage has eroded to the point that the state is almost a virtual tie again. The state is definitely in play, and if Obama wins Florida, it's game over for Romney. However, it's unlikely to be the decisive state since there are 303 electoral votes that appear easier to get for Obama than Florida's 29 electoral votes. 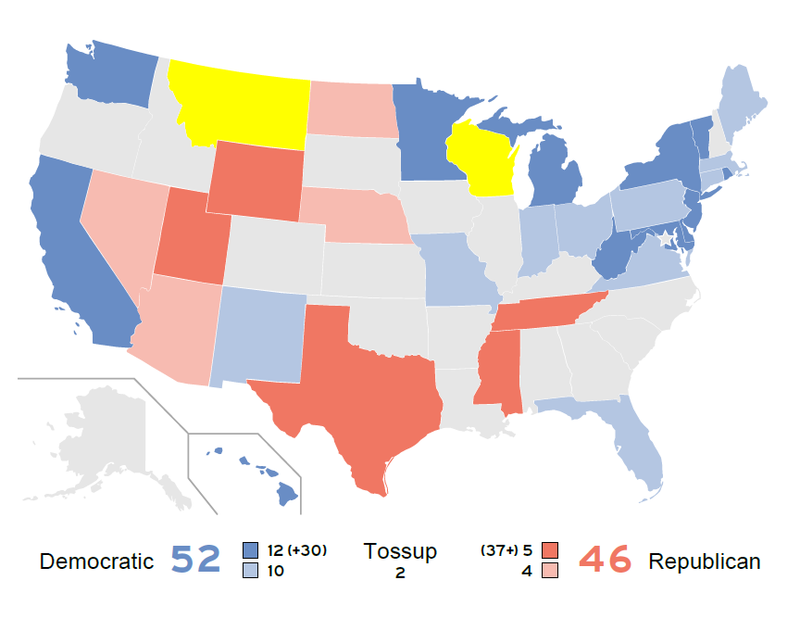 Obama's most likely path to 270 is still through Wisconsin, Nevada and Ohio. This trio puts Obama at 271, barring a huge upset in a state like Pennsylvania, Minnesota or Michigan. Something to keep in mind: in 2008, the polls grossly overestimated Obama's margin in Iowa. Therefore, even though Obama appears to have a small but stubborn lead there, I'm not too confident that he will win. On the other hand, the 2008 polls grossly underestimated Obama's margin in Nevada (as they did Harry Reid's in 2010), so it seems very likely that he'll carry that state even though his polling lead there is also slight. In Colorado as well, the Democrats were underestimated in both 2008 and 2010, though the effect wasn't as big as Nevada.